With approximately 200 million firearms in existence across the U.S., gun manufacturing is big business. Production quantities are huge and growing, and defective products are not uncommon. One of the main reasons for this is porosity, which occurs when bubbles form in a metal casting after it cools. These air-filled spaces may be difficult to detect and often require the use of harmonic, ultrasound or industrial scanning to identify them. Even if invisible, the porosity leaves weaknesses in the firearm body, but if it’s close to the surface it can cause unsightly pitting of the metal. A firearm with pitting or stippling might not look as attractive as it should but it’s entirely functional, and manufacturers are reluctant to scrap these units. It’s possible to save a pitted gun body using laser welding to repair the damage, and gunsmiths are increasingly beginning to realize the value of this method. Given the low investment and easy finance options available to purchase laser welding products, repair companies are able to significantly increase the quality and quantity of repair work a business brings in. When you view the porosity on a gun surface, it can look like a pin-hole or a larger hollow. Deep porosity is typically caused by an open pocket beneath the surface of the metal. If the pocket contains impurities this can further weaken the product. By firing the laser welder into the hole or pocket at a 90 degree angle you can burn out the remaining metal and impurities, while reshaping the hole for repair. To refill the holes, gunsmiths hold filler wire made from the same metal alloy as the gun body against the repair area and fire the laser welding machine into the pocket. This causes the filler wire to melt and pool into the pocket and fill it completely to the surface. Once it cools and sets, the weapon is cleaned, polished and restored to full strength. Barrels and other parts of gun bodies are brazed together, and conventional welding delivered at a regular heat can melt the brazing. This ruins the sighting and damages the accuracy of the weapon. Laser welding uses lower heat input, which makes it suitable for repairing small parts, filling dents and pitting and preparing the metal for hand polishing to bring the piece back to its ideal condition. To maintain the esthetics of a firearm, it’s essential to match the coloration of the metal as closely as possible. Regular welding at a high heat can cause a change in the color of the metal, as does a change in density. It can also cause distortion of certain parts of a firearm if too much heat is applied to them. Because laser welding delivers a minimal Heat Affected Zone (HAZ), the gunsmith is able to maintain a consistent density and color. With the value of the firearms industry to the U.S. economy, it’s essential to avoid unplanned obsolescence caused by porosity. 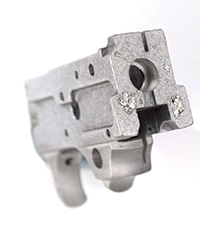 Laser welding can resolve a high percentage of porosity problems in gun bodies, and this is the reason so many gunsmiths have begun using this method of repair. To learn more about laser welding, please visit us at www.laserstar.net. Watch our educational videos at www.laserstar.tv or download our latest product catalog today. If you have any questions, please contact us directly. EZ-Link™ Software, and EZ-View® are registered trademarks of LaserStar Technologies Corporation. In the interest of technological progress, we reserve the right to make technical changes without notice.